Since we’ve talked about table of contents and international fiction this week let’s take a look at both through the recently announced official table of contents of “Clockwork Phoenix 4” edited by Mike Allen. The first three editions of Mike Allen’s “Clockwork Phoenix” anthologies published some amazing fiction and are three of the best collections of short stories I ever read. Some of my favorite modern writers signed stories featured on the three “Clockwork Phoenix” anthologies, among them Deborah Biancotti, Ekaterina Sedia, Gemma Files and Laird Barron. “Clockwork Phoenix 4” started as a Kickstarter campaign, successfully funded on August 9th last year, and received during the reading period more than 1,400 stories. Truly impressive. 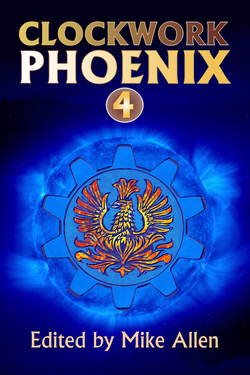 Mike Allen has selected 16 short stories and 2 novelettes for “Clockwork Phoenix 4”, from authors located in United States, United Kingdom, Canada, Australia, Netherlands, Hong Kong and Japan. He plans to release the anthology on June, in both trade paperback and e-book formats, followed by an official reading and launch party in Boston in July at ReaderCon, the same convention where Mike Allen started the Kickstarter campaign.